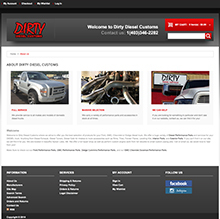 Dirty Diesel customs sells over 30,000 different parts for all types of vehicles (but mostly for tricked out trucks). 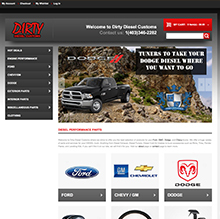 They needed a robust e-commerce website that would allow them to track orders, easily manage inventory, fulfill orders and all work on mobile, tablet and desktop. Using Magento framework Red Cherry built out a website that was very easy to navigate but also full searchable to any part. 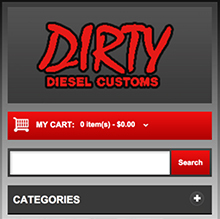 With a strong web store and conjunction with a digital marketing campaign Dirty diesels is now humming along better than ever. 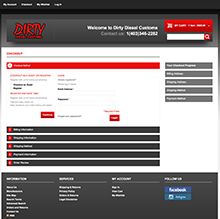 Users can find parts easily by drilling into make, model, and part type right form the menu. Responsive website means for traffic with over 2 billion people using Smart phones your website needs to be responsive. Simple one page checkout using Magento accordion means a much lower shopping cart abandonment rate. 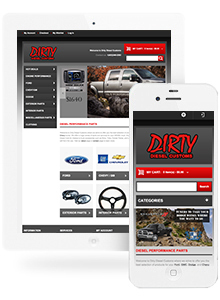 Mobile view makes finding truck parts a breeze even if your broken down somewhere in the bush.